A party of eight people — eight people — left their server without a tip at a seaside eatery in Belmar, New Jersey. Instead, they scrawled “LOL” on the check. 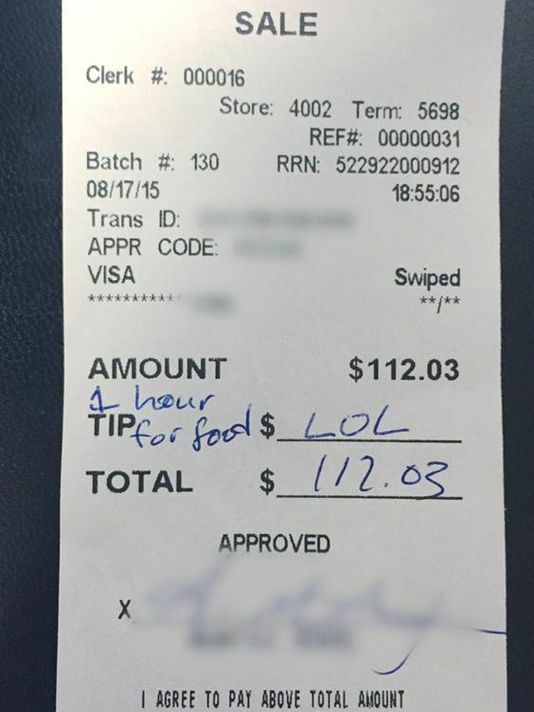 The Asbury Park (N.J.) Press reports that Jess Jones, a 20-year-old Rutgers University student, posted the image of the non-tip on Facebook. Jones waits tables at D’Jais Bar & Grill. The diners left an explanation for the cruel message: “1 hour for food.” Jones doesn’t deny that they indeed had to wait an hour, but says they were notified the kitchen was “busier than normal.” She stands by the service she provided. The minimum wage in New Jersey is $2.13 for tipped workers. As Jones notes, tips are vital for servers. You should always do it. Correction: An earlier version of this post failed to mention the minimum wage for tipped workers in New Jersey.